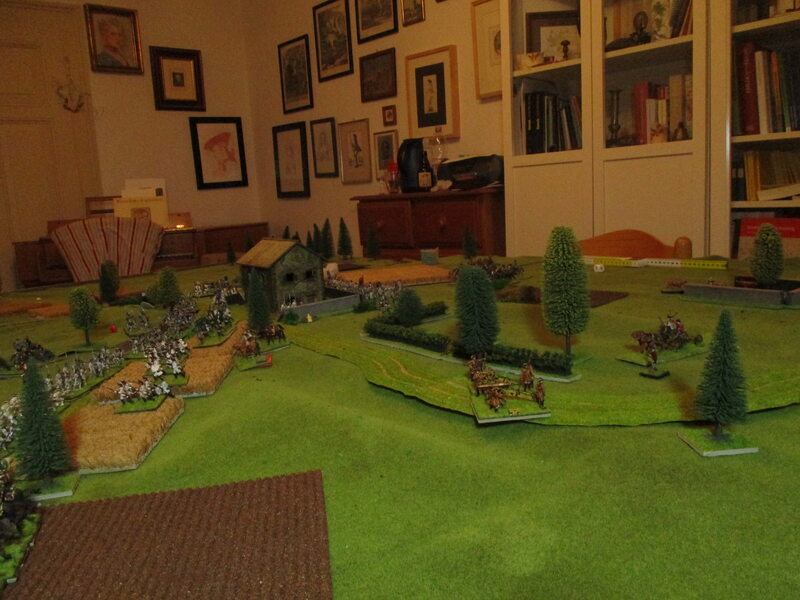 We played this night the battle of Parma. I supposed that the refight on the tabletop would be very similar like the real battle. The view from the Austrian side. At the left the Austrian cavalry under de Vins and Sachsen-Hildburghausen with the left infantry wing, at the middle Mercy leading Czungernberger's infantry in person. 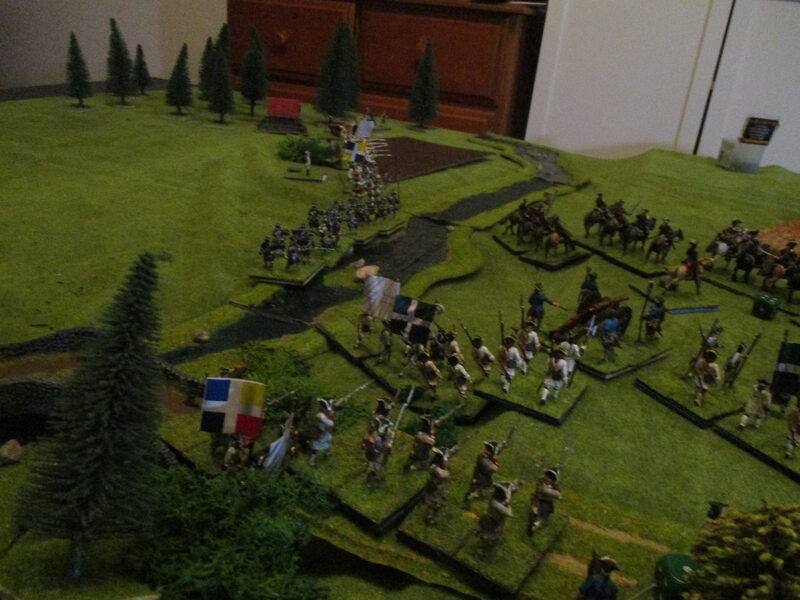 At the right Brandenburg-Culmbach's brigade ready to help Mercy in the center. My battle plan as the Austrian commander was simple. I hoped to get a double move and could occupy La Crochetta und I wished to destroy as many units as possible before the Allies could bring their elite troops forward. The Allied rigth wing or wing of honour. At the left: de Bonas Piedmont-cavalry, at the front Savoya's brigade of Piedmont foot, behind them in one of many walled gardens is the brigade Champagne (I used Navarre). 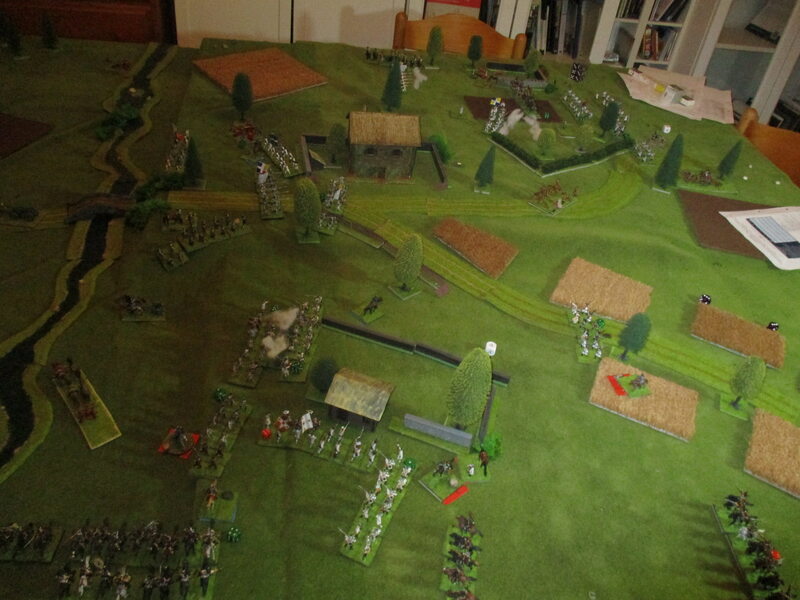 At the right the masses of French infantry in the center. First Mercy advanced but his move felt too short. 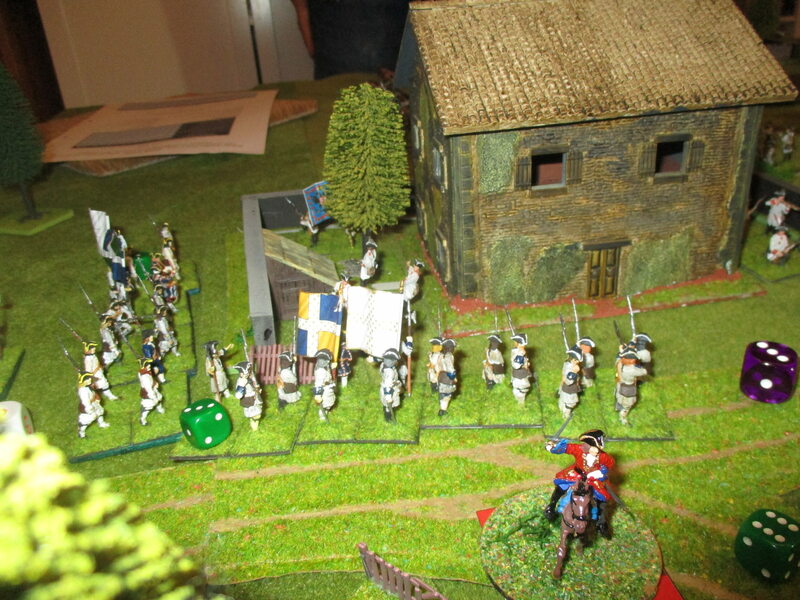 All of his grenadiers had hedges in their way. The Allies had more luck occupying La Crochetta with one bn. of their mixed brigade of grenadiers. Czungenberger ordered a fruitless firefight. I moved my artillery forward. It was maybe a shock for the Allies. 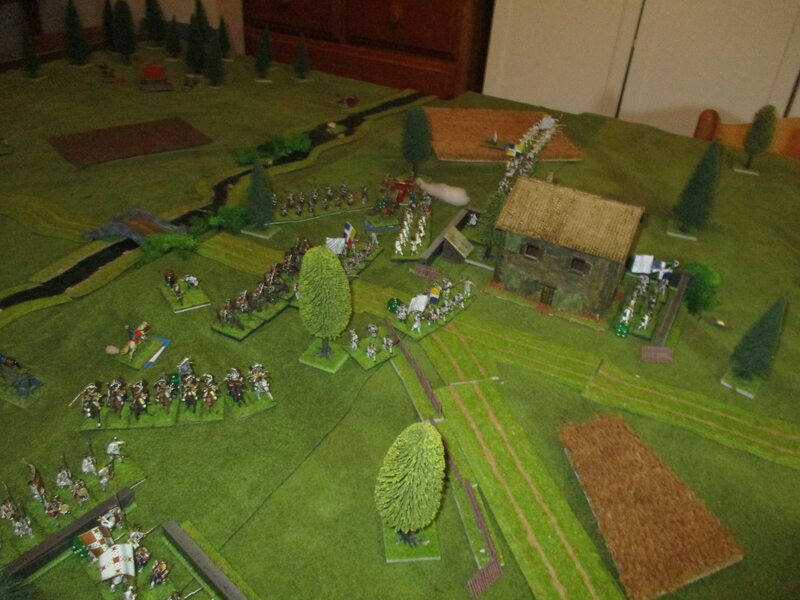 Next turn I decided that it would not help to stay in front of La Crochetta and ordered Czungenberger's fusiliers to assault the tavern. Not the best decision as it looks. The defenders fired effectively and my fusiliers were defeated out in hand to hand fighting. 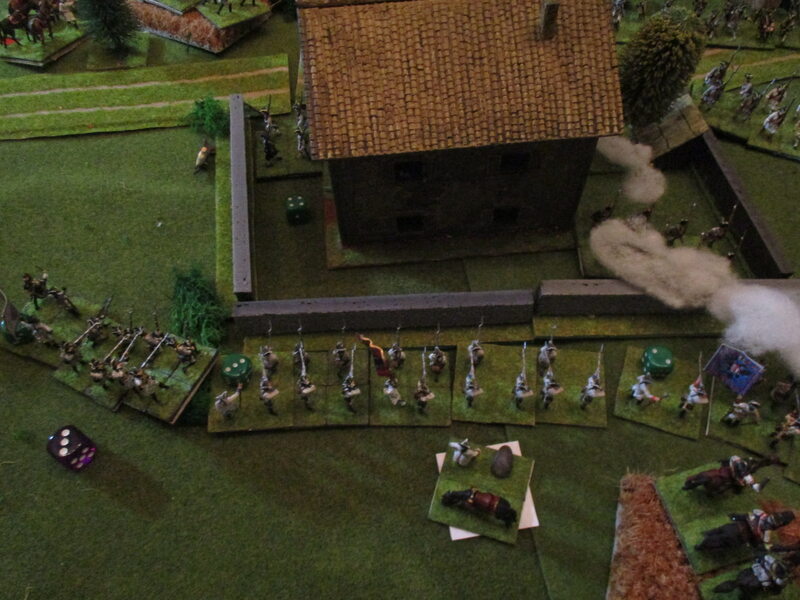 The defending French grenadiers had to leave the walls, but just in time were reinforced by the Piedmont-grenadiers. Sachsen-Hildburghausen and the baron de Vins advanced as fast as they could. Sachsen-Hildburghausen's batallions forced Bonas' horse to give way as he wanted not to be killed by Austrian volleys. Finally it didn't help. Bonas had no place left. He could leave the battlefield or attack and decided to vote for the way of honour. Both regiments charged into the bn.s of my left wing. 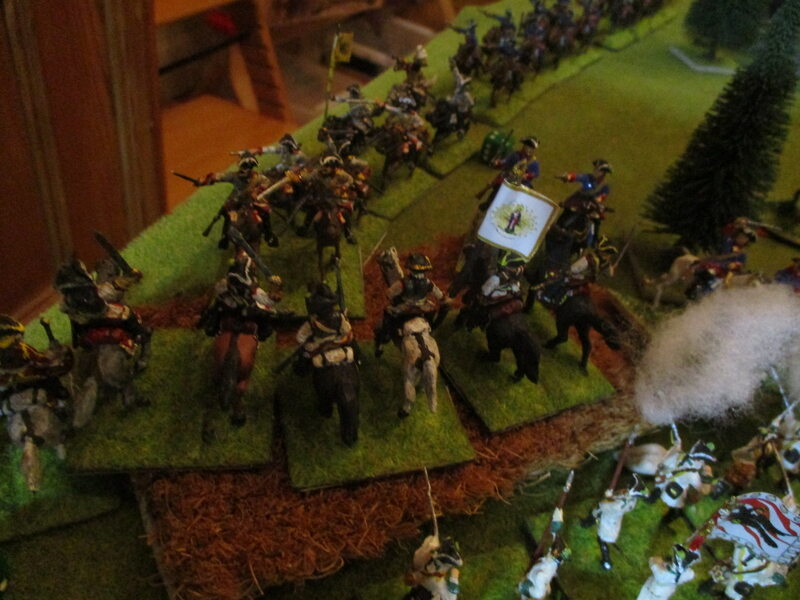 His brother in arms, GL de Savines tried to drive his masses of French horse in de Vins' flank. But Savines stoped surprisingly and now his leading unit of cavalry was charged by de Vins' cuirassiers. 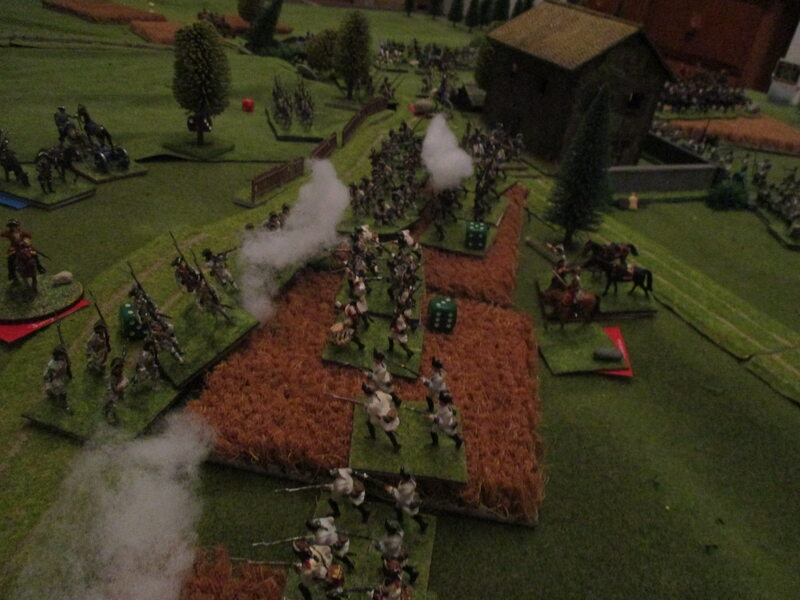 Savines' whole brigade was still in column and the fight was short and decisive. 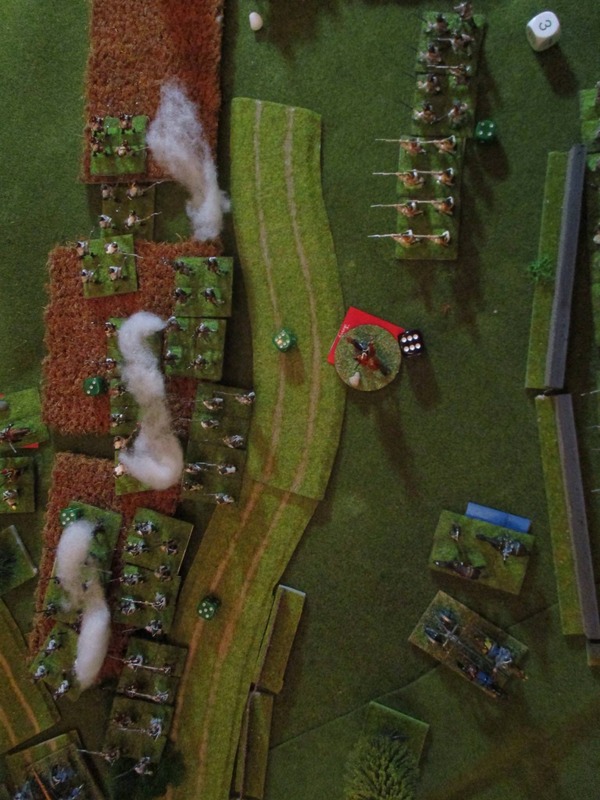 Savines lost his first unit leaving the battlefield in retreat. 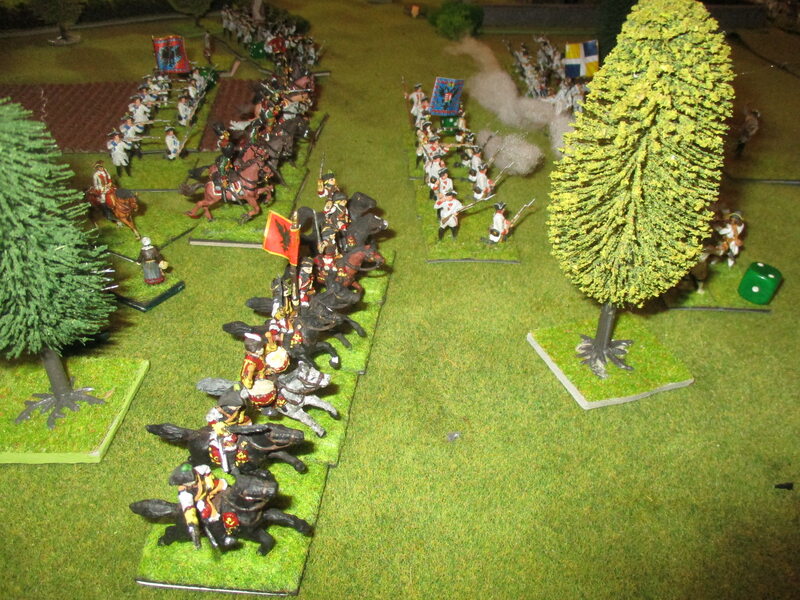 At the center Czungenberger managed to move all of his grenadiers in position for their first volleys. Savines' horse charged in column. The result of Bonas' charge was brutal and decisive. He lost both of his units in a bloody short fighting. Nearly the same was what took place in the center. 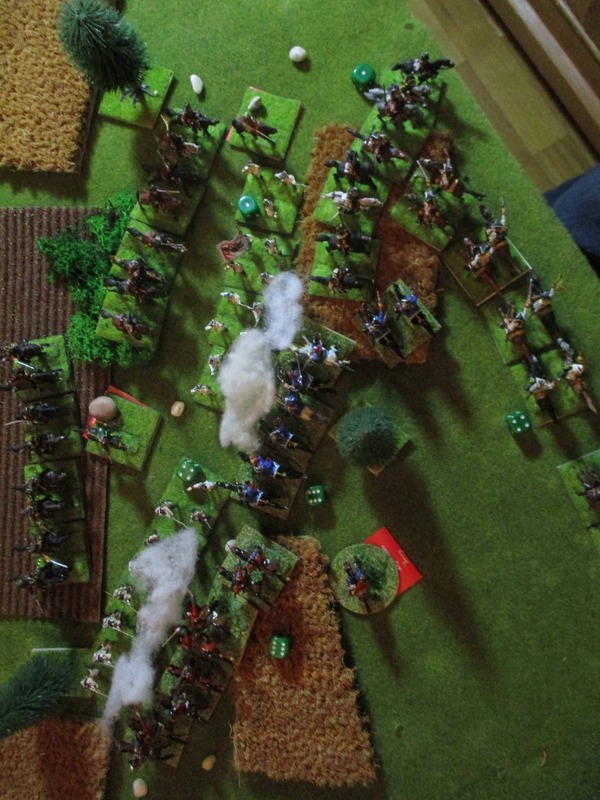 Savoya wanted not to shoot it out but charged with his impressive number of fine infantry. One bn. survived the fighting because it could retreat before the melee. Two were crushed by Austrian bayonets. However I lost my second unit in this cruel fight. 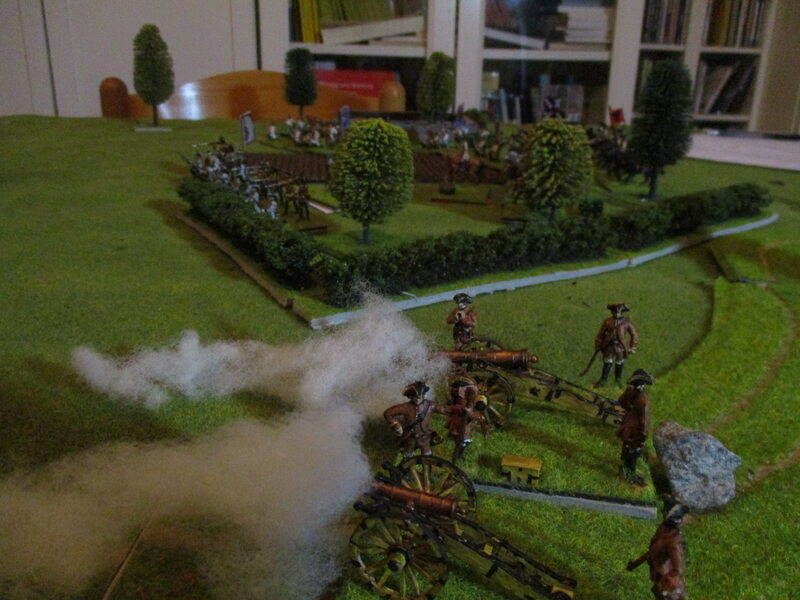 Brandenburg-Culmbach ordered his brigade to charge La Crochetta. The second try of my army was brutal again. The Feldmarschall-Leutnant himself was shot at the head of his soldiers. But in return they stormed the stronghold and the Piedmont-grenadiers had to retreat, falling in their French comrades. At my right wing Coigny recognized that he had no time to loose. Therefore he allowed the cuirassiers to charge. 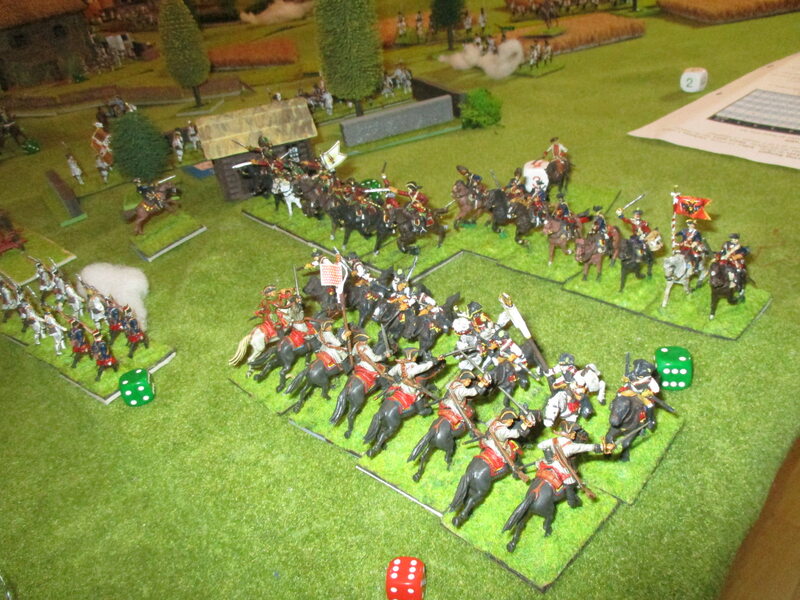 They charged bravely but were brutaly shot from their horses and had to retreat after a short melee. A view on Coigny's center. The large brigade under Guerchois never saw action. The same happened at the left wing. The Piedmont-guards and Mezou's complete brigade was too late. After 1 1/2 hours the exhausted Coigny decided to retreat with what he had left of his army. His left wing and the brigade Champagne could cover the retreat. Perhaps he still had 3 brigades intact. 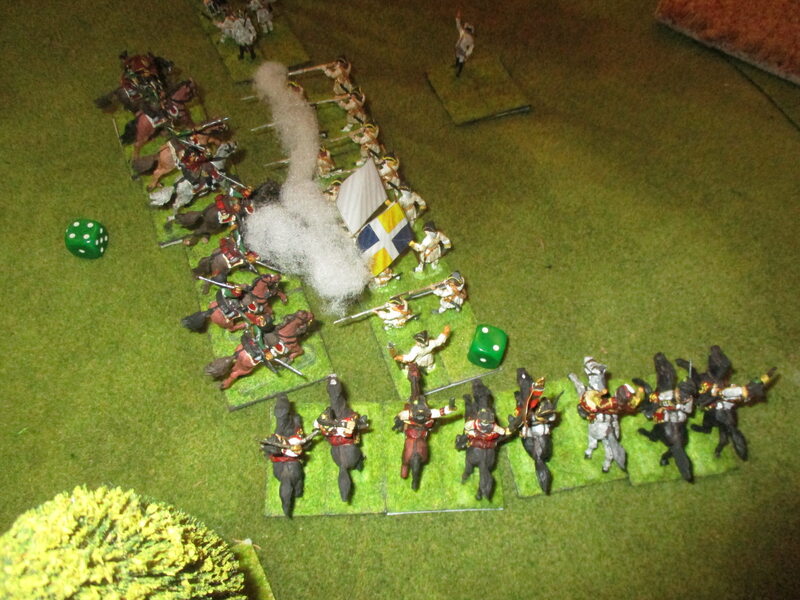 But he lost halve of his cavalry and most of his best infantry. It was sure that he would not rally his grenadiers in time. Mercy prefered to stay at the battlefield. His losses were moderate. But he knew that Coigny's amry still outnumbered his army and to follow the French could end in a desaster. To destroy most of the enemy's right wing was more than Mercy could hope for. I myself played Mercy and my dear wife had the French under Coigny. I never thought that the Austrians had a real chance. But my wife was tired and I think the result is stunning for a game of 3 turns only. Nice short battle and a surprising outcome! Cheers! I decided to leave the toys at our corridor. Perhaps we will continue the battle next Weekend. I don't know. In my opinion the Austrians would have now the chance to roll up the whole Allied left wing. But the Allies have 2 rested brigades on their right to crush the Austrian left. The Austrians can occupy La Crochetta with 2 bn.s but would have just one bn. 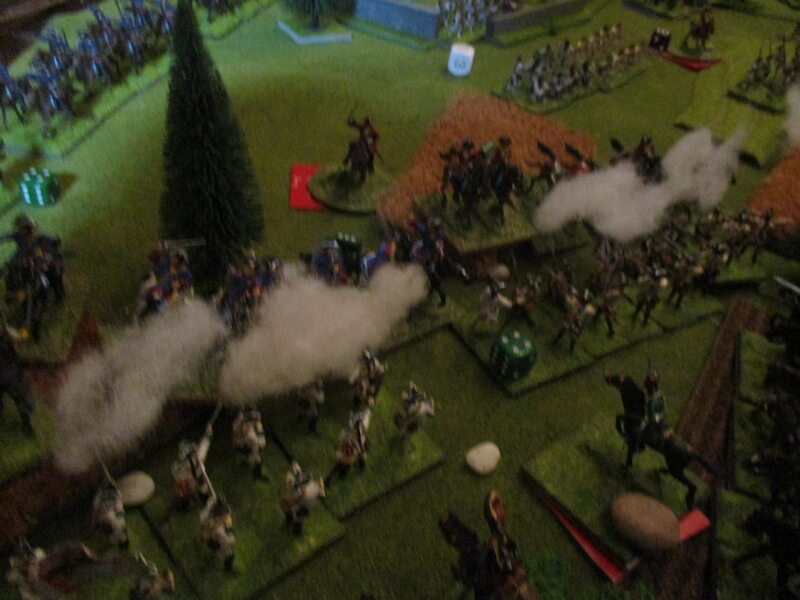 and Hohenembs' cavalry to face not only 2 brigades of infantry but their 2 batteries of artillery too. It would be very interesting how you think about the battle, when you would play it. Eager to see the continuation of the battle! When we play WPS again, I would preferably choose first the battle of Guastalla. After some encouragement by dindin we decided to continue our large battle. My plans were very easy. 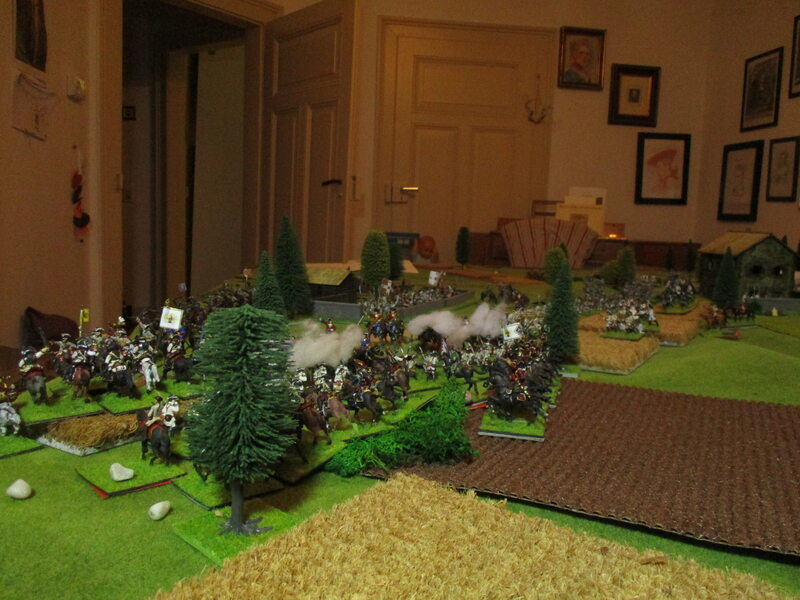 Pull back all softened units and brigades and continue the charges with my successfull cavalry under de Vins. First the Allies recogniszed their remarkable chance to recapture La Crochetta which was occupied by one of Suckow's batallions. 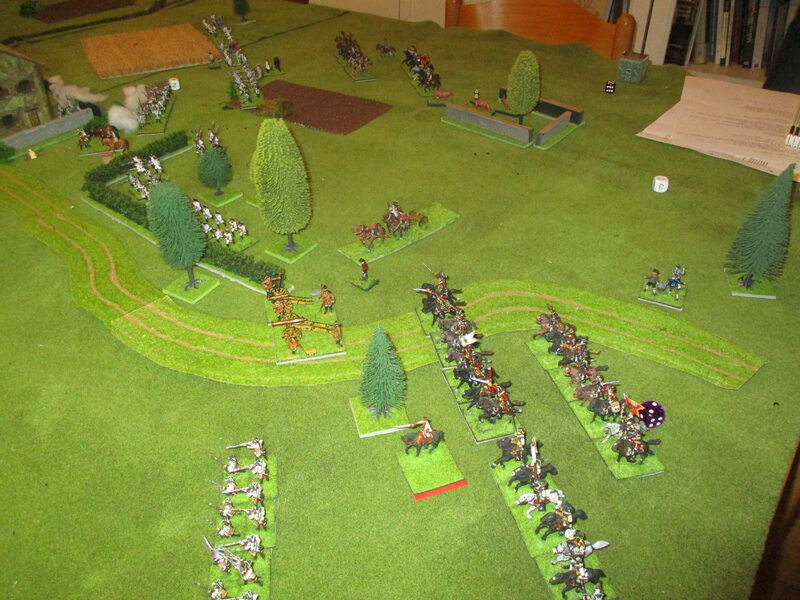 Guerchois ordered two of his four batallions to take La Crochetta and my poor fusiliers not really had a chance to stop them. Fortunately my fusiliers had to retreat only. The other batallions of Suckow's brigade had to retreat before because I wanted that all of them would rally to stop Mezou's brigade and the guards. Counterbatteryfire was successfull. I used both of my batteries to destroy Savoya's artillery which had killed FM Mercy before, when they fired in the flank of one of Czungenberger's last units. 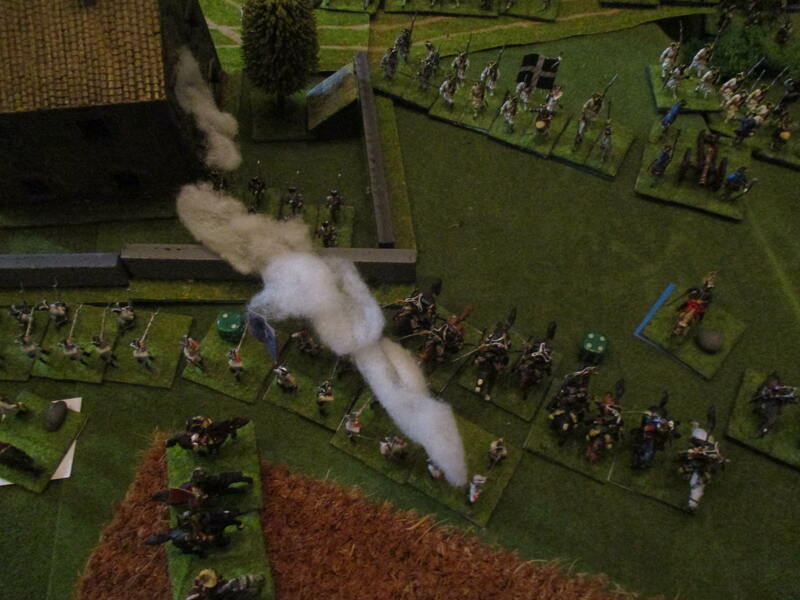 At this moment the baron de Vins didn't missed the chance to attack the French horse again. Savines could change the formation of his cavalry but they were destroyed neverthelesse by the mighty Austrian cuirassiers. 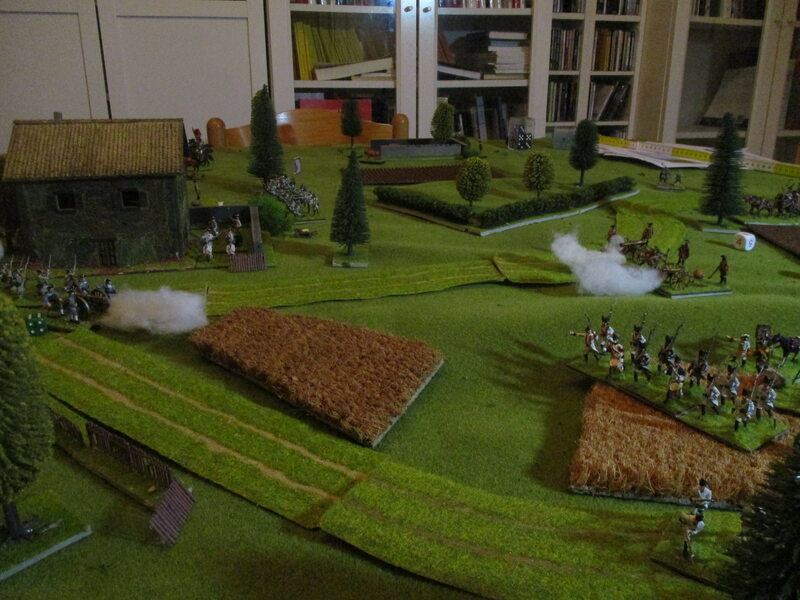 Another of de Vins' regiments charged the rallying last unit of Piedmont line infantry and beated the poor Sardinias. Savoya now lost his whole brigade. Now I assumed that to destroy the third allied brigade was very likely. The Allied grenadiers or Savine's cavalry. After rallying most of my leftwing and center infantry I just had to throw these four units in the battle. At the same time when Guerchois had captured La Crochetta - Mezou crossed the stream and advanced at Suckow's and Hohenembs' brigades. Well, most went as I hoped it. I just had to conitnue my plan to pull back Hohenembs and Suckow before they could use their heavily outnumbering numbers at my right wing. De Vins' cuirassiers prefered the agressive style of fighting and could throw His whole cavalry forward. The last cavalry under Savines was defeated and abandoned the battlefield. I decided to use only a last push to demolish the whole Allied army. Therefore Czungenberger had to attack the cascine behind the road to Cremona with all he had. 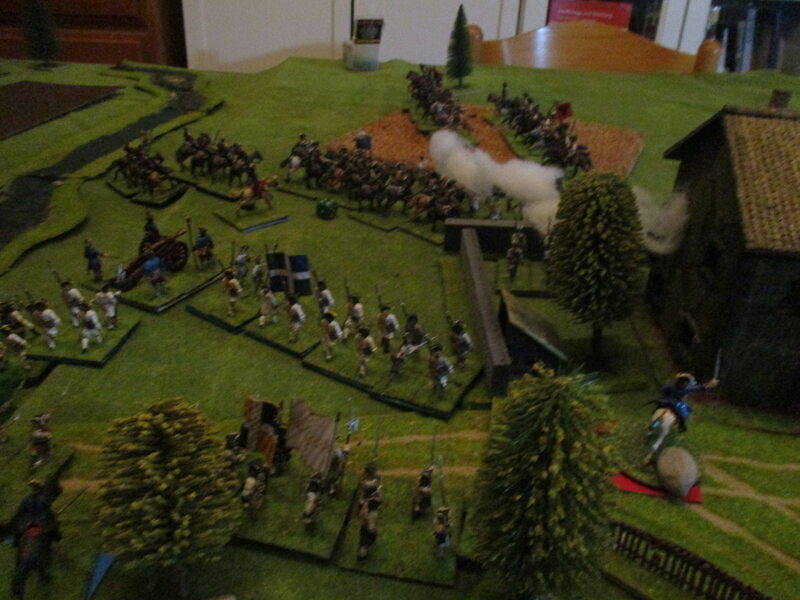 The assault looked brave and bold but the French defenders of the cascine could turn and showed no mercy with my grenadiers who were defeated at once. The continuation of the Austrian pressure on the Allied right wing had the effect to force the French grenadiers to leave the battlefield. 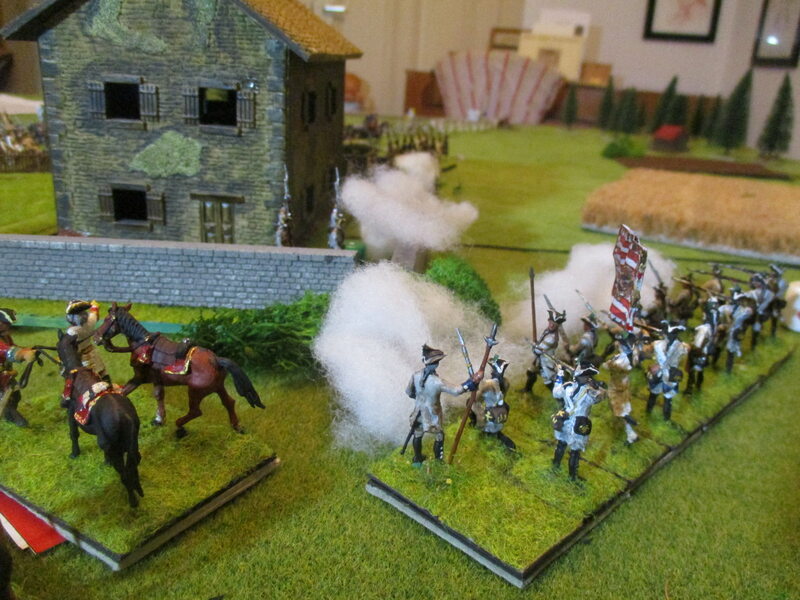 Their comrades tried to stay and shoot very effectively at de Vins' horsemen. 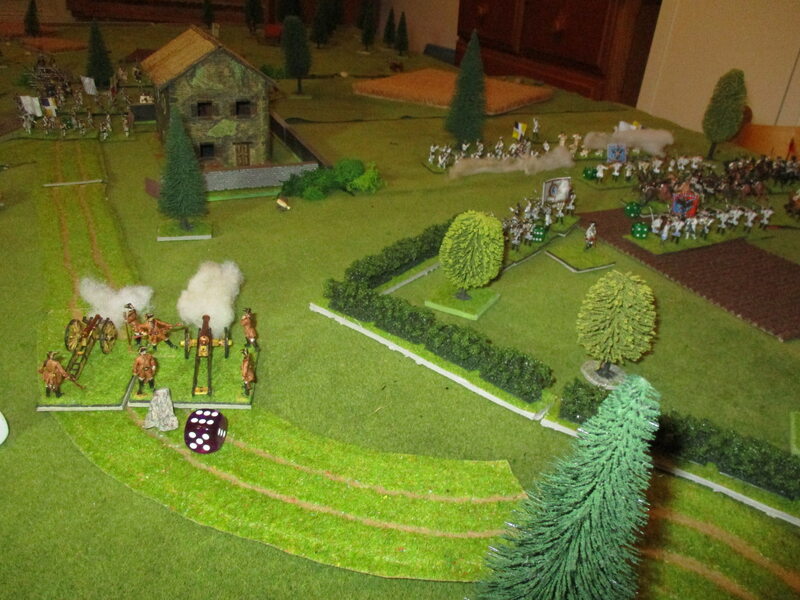 My batteries now had the task to destroy the garrisson of La Crochetta and could force one batallion to retreat. Coigny still had the chance to destroy my right wing. But my nasty left wing forced him to change his plans. 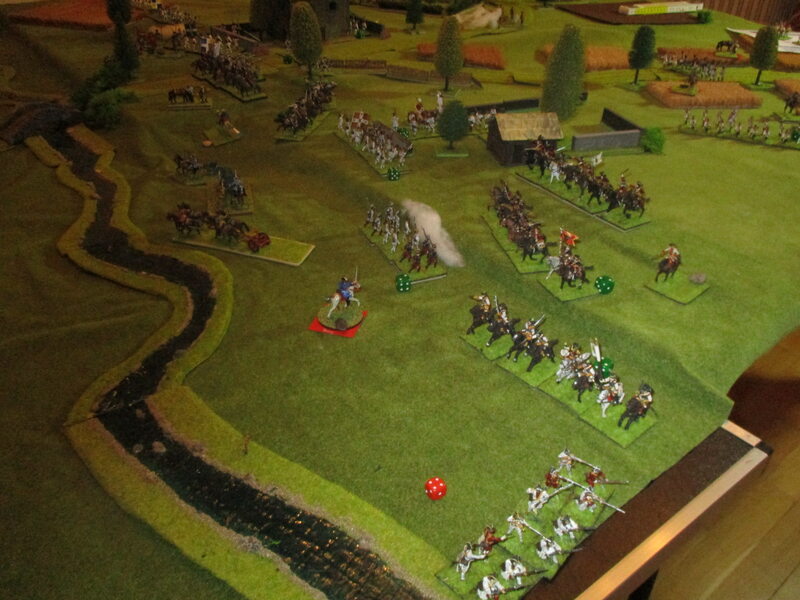 There was a good chance that even with the small setback at the cascine that Sachsen-Hildburghausen's infantry in combination with de Vins' horse would roll up the whole French right flank. Therefore Coigny deleted the plan to overwhelm my right wing and send Châtillon's cavalry to deal with my serious thread. The Sardinian Guards had just to stay more or less in position because Coigny feared that they would mask his 8lb. guns at his right wing. 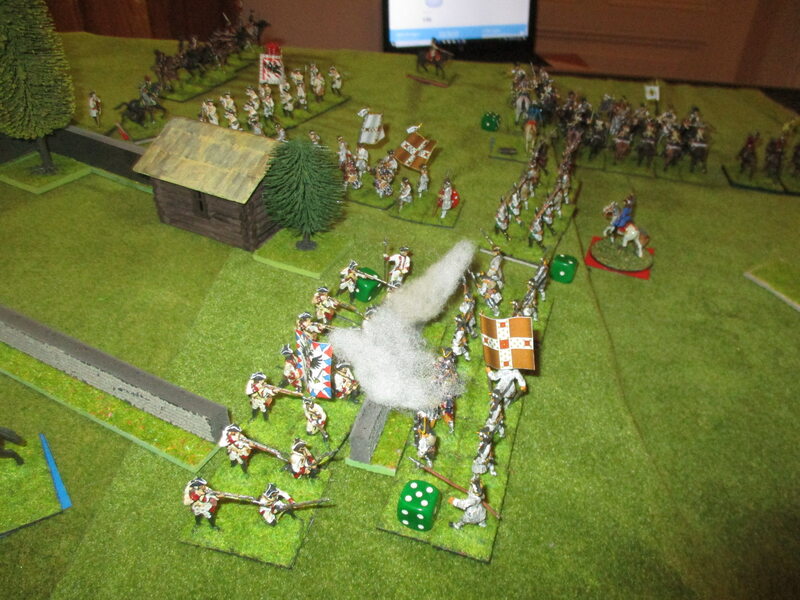 The Sadinian grenadiers showed their value when they shot at some of de Vins' dragoons who run into the supporting dragoons. 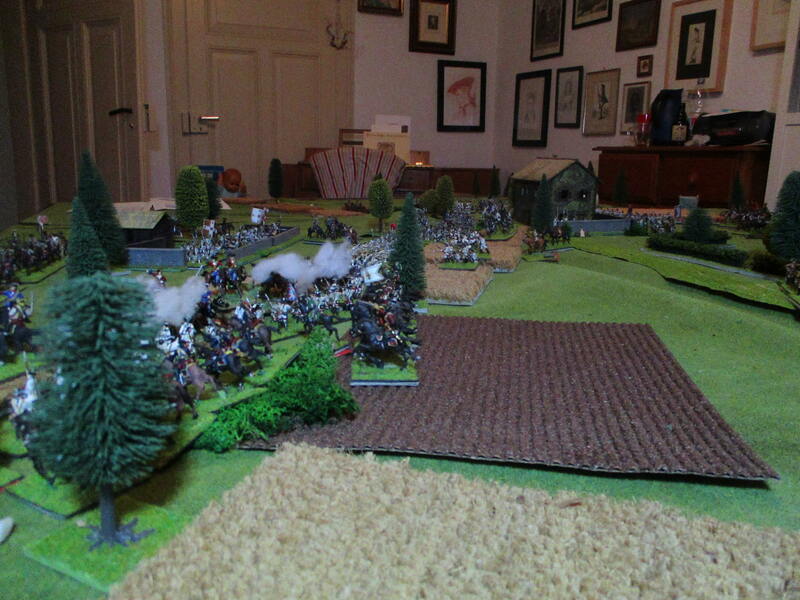 The retreat of both units at this crucial moment of the battle could be of some importance. 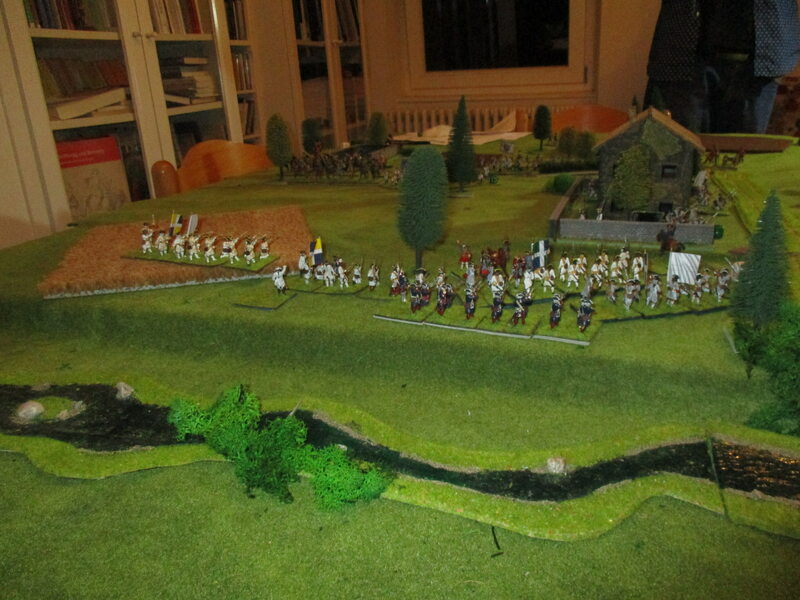 Than Guerchois got orders to rescue Cherchais' small brigade and had to send 2 of his batallions. But would he move fast enough to change the outcome of the battle on the Allied left? But now maybe Coigny didn't note that Mezou's brigade would fight 2 brigades alone although FML Hohenembs and FML Suckow showed no inclination to attack and pulled back their units since some hours. Finally Hohenembs and Suckow changed their behaviour and advanced at the enemy. 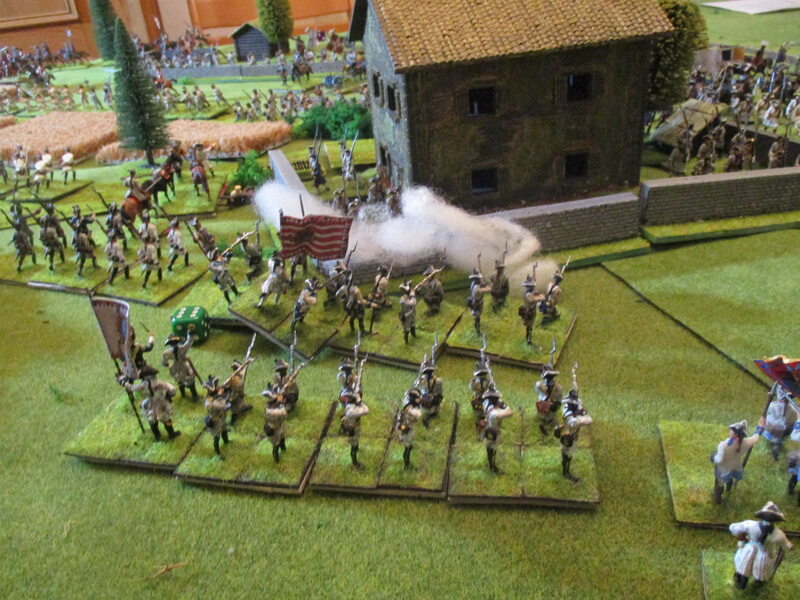 But the French shot effectively and all of Suckow's batallions had to retreat. 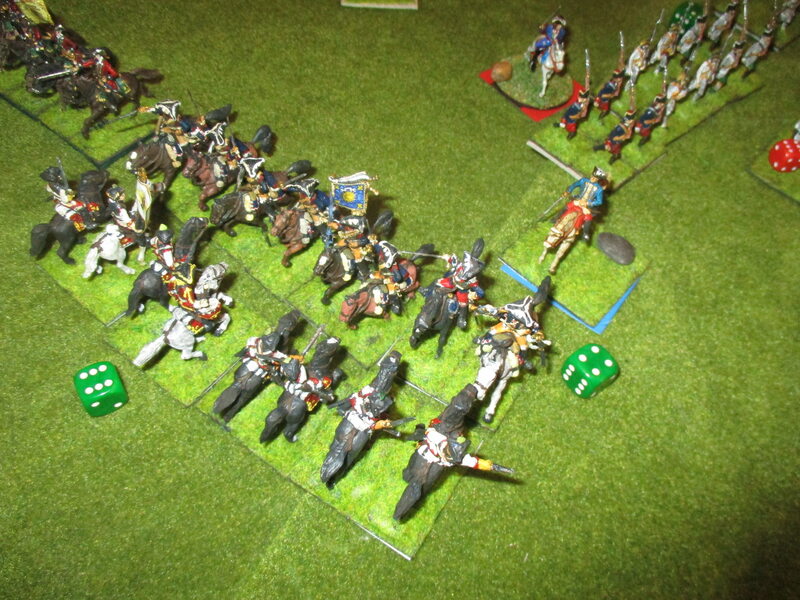 However Hohenembs recogniszed the chance to outflank Mezou's infantry. After the retreat of Suckow's leading batallion now Hohenembs had both of his units in position to charge one of Mezou's batallions in front and flank. 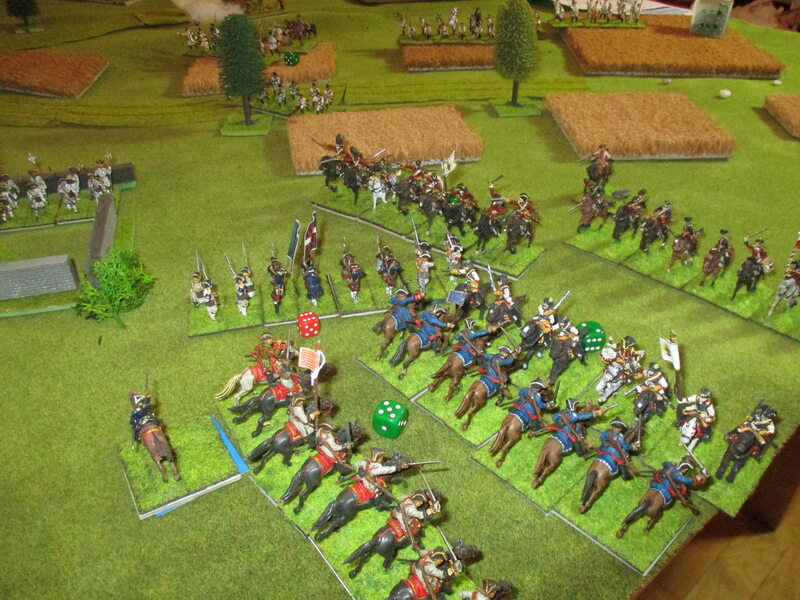 Finally the poor fusiliers have no chance when Hohenembs' cuirassiers came in hand to hand fighting. At my right wing I'm not idle (although I had won with the 11th French unit done fore) and ordered a all out assault. Both of Cherchais' batallions were charged by Sachsen-Hildburghausen's (named Hildi by myself ) brigade and both were destroyed although one of the French batallions could fire in the Austrian charge. The last success of the French arms: the cuirassiers du Roy supported by Pons-cavalerie charging and destroying de Vins' cuirassiers. But it didn't help. The Austrians won a decisive victory in turn 8! The French lost 13 units, two more then I needed. I think that the view of the battlefield is really interesting. The French could push back my left wing because they had most of their artillery there and I wanted to save my regiments there, while I was successfull with my right wing although the Allies had most of their finest troops their (the Sardinians and the Allied grenadiers later). 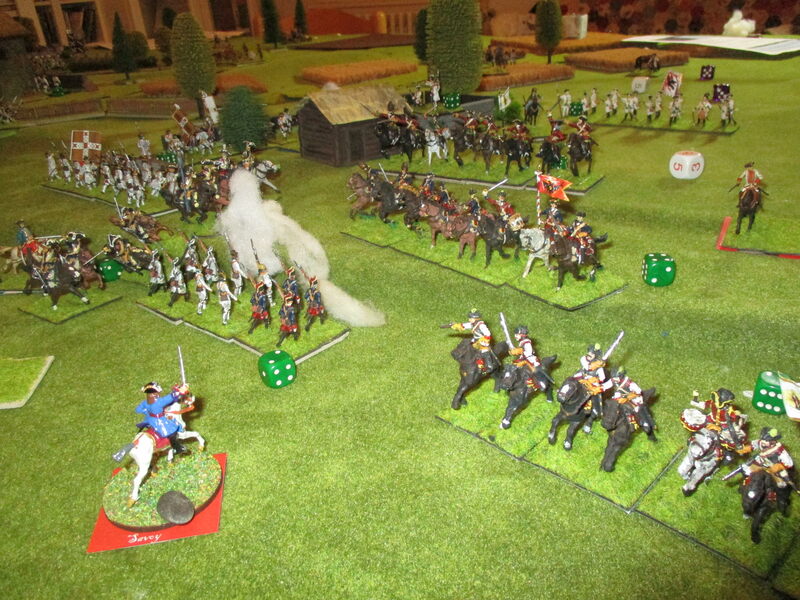 Perhaps the successfull charge of de Vins' cavalry was crucial for the outcome of the fighting. I hope for some comments about the battle. I myself have to admit that I found the scenario very exciting and even my wife (as Coigny) liked it very much. Maybe my victory was decisive but I had very much of luck in the last turn when I rolled 4s and 5s only. In the end the French had the chance to survive the battle if they could rescue Cherchais' brigade and to occupy La Crochetta again in turn 9 was very likely because I had no batallions who could attack the tavern. All of Suckow's batallions had to rally and my other brigades were to far away. Besides Cherchais refused for 2 or 3 turns successively and could not react properly when my grenadiers and Sachsen-Hildburghausen's brigades advanced. Huzzah for the Austrians! A very nice AAR and certainly an interesting scenario that I would like to try at some point in the future. I feel really flattered that I voiced for the continuation of the battle and you agreed, but, as you saw, you offered us an exciting narration of a bloody battle with many turns and twists! Fierce fighting around la Crochetta and the cascine and cavalry crashing on cavalry, I think both opponents had the chance to win! Your massed battery did a good job and in some crucial moments maybe luck was with your side, but this is the game! Some pics you took are very atmospheric, thank you for posting this AAR, I hope we'll be able to play it in the near future! Cheers! I'm glad that you like it. My wife and I had the impression that Parma is a really interesting battle. Maybe the Allies outnumber the Austrians but they have a Dithering CinC and the Austrians a Dashing Feldmarschall and even Mercy's replacement Württemberg is Dashing. 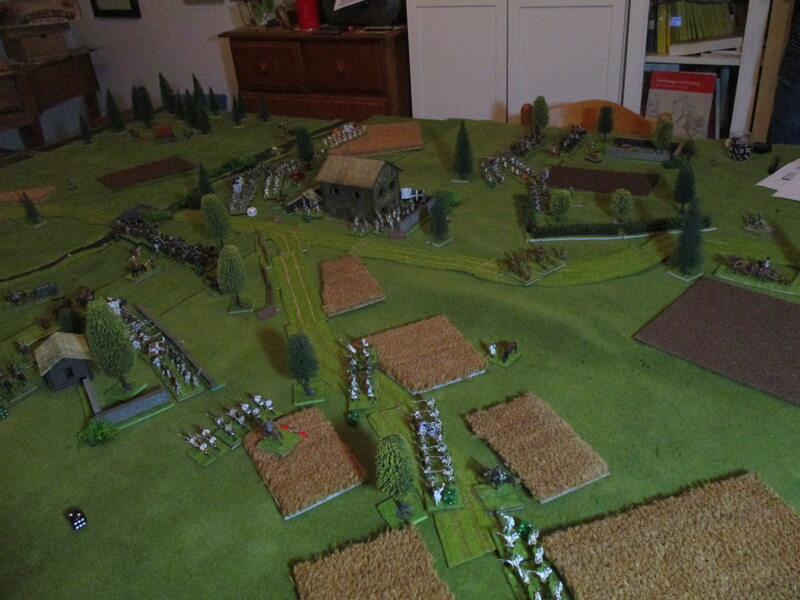 That helped a lot to move the Austrian troops forward and backward as I wished. Perhaps reasons enought to get a balanced game. Just try it and write your impressions! I hope to play Guastalla or another battle of the WPS in October. I will try it for sure! And this time the Austrian fox will not try to step backwards, he must attack with full force! Let's see what will happen then! Be warned! The Austrian artillery is very important. I remember that your Austrian Fox normaly use the artillery very effectively.